In August 1643, 5,000 women protested outside Parliament, wearing white ribbons to demand peace in the ongoing civil conflicts. During the day a soldier fired his pistol at an apprentice seamstress, who was in the streets on an errand unconnected to the protest, and shot her dead. In the subsequent investigation he claimed his weapon had been discharged accidentally and he was exonerated. This shockingly modern-sounding anecdote is one a whole series of moments in Sara Read’s Maids, Mothers, Widows, which bring the reader up short. In giving a sense of what women’s lives were like between the mid-sixteenth and mid-eighteenth century, the book switches dramatically from making the past feel alien, and making it seem weirdly familiar. Maids, Mothers, Widows is an engrossing and brilliant book, which combines historical scholarship with a vivid style and a knack for the poignant or disturbing detail. Read deals impressively with the task of providing an account of women’s lives which is sensitive to differences in class and situation, without reducing it to a skeleton description of what they had in common. Organising the book into “Women’s Work”, “Personal Care”, Women and Reproduction”, “Women and Religion” and “Women in Public Life”, she sketches the parameters within which women lived, and explains the institutions and practices which contributed to the meaning of their lives. Overall, it’s a superb book: scholarly, enjoyable and challenging. Since this is a popular book, Read is relatively light on engaging explicitly with previous historical work (though the bibliography provides a world of directions to run for the reader unfamiliar with her field), only mentioning it infrequently, such as the reassessment of Early Modern parents’ emotional investment in their children. She has to rely on a much vaguer sense of what people assume or know about the period, and manages to discreetly correct a lot of misapprehensions. Some of the most striking include the idea that people drank beer instead of water on health grounds, the assumption that maternal mortality rates would have been higher in her era than the Victorian years, and the idea that most people would be married before their late twenties. From one point of view these are simply historical facts which the general reader might have incorrect information about. But the impact they have points up the extent to which they help construct the meaning of the present. Read’s book inevitably sets up a dialectic between past and present, in which our ideas about women and their lives are challenged in both directions. Correcting our errors of fact about past women’s lives reveals the ideologies behind those mistaken assumptions, and makes us question why they seemed logical and certain. Sometimes the technicalities of the historian’s craft are themselves the basis of the touching or impressive detail. Whilst describing women’s involvement in printing and publishing, Read notes that women were forbidden for women to take charge of her husband’s business except in his absence of after his death. She records the books and pamphlets published by Hannah Allen after inheriting her husband’s business in 1646, and her virtual disappearance from the records on her second marriage to Livewell Chapman in 1651, only to reappear in the charity book of the guild as “Hannah Chapman”, presumably on the death of Livewell. The problems with tracing the career of his industrious widow map askew onto the problems she faced in a sexist society: she appears to our eyes on the death of a husband, runs her own business, disappears again as femme couvert and then reappears under another name as in need of support. History and historiography and the ethics of reading weave around each other, as our desire to see Hannah and know her is enabled by another’s death, frustrated by a patriarchal society and then allowed again by her poverty and unhappiness. A generally more light-hearted example is provided by the correspondence of Brilliana, Lady Harvey, whose separations from the men in her family produced the letters which permit us to listen to her. She writes to her husband about her small sons and their impatience to see him: “I thank God, Ned and Robin are well; and Ned asks every day where you are, and he says you will come tomorrow”. Later in her life, when Ned is at Oxford, she sends him a goat pie, tells him to remember to pray and also to look out for French novels and a looking-glass for her in the shops, and reluctantly agrees that she should probably see a doctor about her heavy and painful periods if they get any worse. O Adam, Adam! What hast thou done! My comforts are taken away before I had well received them: was it all lost labour? The short quotation provides evidence for her argument about emotional connections with children as well as an unexpected moment of connection between the reader and the grieving woman. It also reveals something of the way pain and suffering were incorporated into a world view, both in terms of phrasing the baby as the comfort of a mother and the return for her pain, and in terms of a theodicy. Presumably Hulton is combining the curse in Genesis with the soteriology of the Pauline epistles: labour and its pains are understood as the necessary consequence of Eve’s sin, but the death of the baby is an extra cruelty and injustice put down to the Adam, identified as the source of death in the Adam/Christ parallel: “For since by man came death, by man came also the resurrection of the dead”. Is seems possible Hulton is objecting that both Eve’s and Adam’s sins have been visited upon her and her child, in a daring and furious outburst. The cry of pain is so tightly wound in its attempt to make sense of suffering that it feels almost presumptuous to make our own attempt to understand the intricacy the words and the feelings behind them. 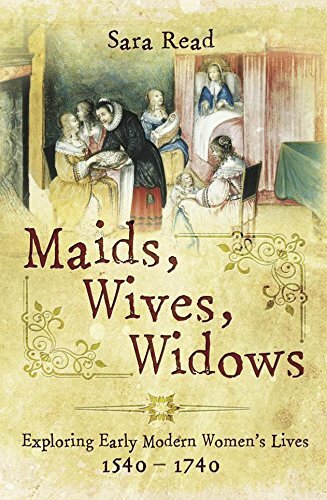 Maids, Wives, Widows: Exploring Early Modern Women’s Lives, by Sara Read/ (Pen and Sword Books, 2015) 978-1473823402 £19.99 I am grateful to the publisher for providing a copy for review.